The bond between a cavalryman and his horse is unequaled in intensity and depth. The soldier and his mount quickly learned to trust each other and once that trust was established, each knew he could count on the other to bring him through any situation. With each danger and each narrow escape, their kinship grew stronger. The longer and more perilous their union, the closer the two became. Often the relationship transcended the physical and emotional, allowing the two beings to commune spiritually. Fate, however, often seems unkind--especially in war, when the destinies of both man and horse hang suspended by two slender thread. At times, both threads are severed; at times, only one. Yet even then, the death of one is experienced by both, and no one can say for whom the death is a greater struggle. For the one who lives as well as the one who dies, this struggle, this battle to accept and, thereby, overcome death is the "Final Battle." Uniform, weapons, equipment and horse furnishings are appropriate to the early 1860's. They could be Civil War Confederate or Federal, or the accoutrements of a cavalryman serving on the western frontier. The love between man and horse is beyond temporal distinctions. 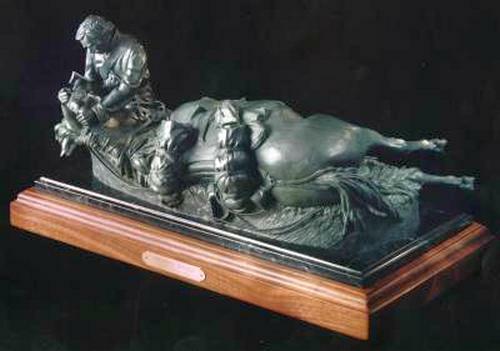 The mare is furnished with a Model 1859 Federal McClellan saddle with crupper and Grimsley-pattern breast collar. The "revised" Model 1859 bridle and bit have been removed to aid her breathing. The soldier's blanket, rolled in a rubberized poncho, is strapped to the cantle; a Federal mounted overcoat is on the pommel. A canvas and leather feedbag is fastened to the off (right) front saddle ring and a carbine thimble, in which the barrel rests when the trooper is mounted, is buckled to the greater-strap "D." The lariat has come loose in the fall and lies uncoiled beneath the horse. The trooper wears a loose-filling fatigue blouse and untrimmed Hardee hat. His sabre belt, with Model 1851 eagle belt plate, and carbine sling are early black buff leather. The cartridge box holds twenty rounds of paper-wrapped ammunition for his .52 calibre Model 1852 slant-breech Sharps. Percussion caps are stowed in the small pouch at the front of the belt. His holstered revolver is a .36 calibre Model 1851 Colt Navy: the sabre, the Model 1840 heavy Dragoon (a.k.a. ‘old wristbreaker.' He wears Federal regulation sky-blue kersey trousers buttoned over ankle boots. This sculpture eluded me for nearly ten years, but being but a vapor of an idea, without form or detail. Then my own horse died. Rainy Day was my first horse. I bought her for my daughter when both were young and we all went through a lot together in those early days. In time, our life circumstances changed and I gave Rainy Day to a friend, expecting that she would have a good home. Instead, she was promptly sold. Finally, after ten years, I was able to locate her and bring her ‘home,' this time vowing to keep her "till do us part." That death came like a thief; for barely a month after we were reunited, she lost her battle for life exactly as depicted--in my arms. Lying there, her eyes searched mine, seeming to question, to ask for help in understanding. But she never lost courage. Her gracious acceptance of her fate taught me a lesson I shall never forget. When, at last, it was over, I understood what her eyes had been trying to tell me--that it was time to bring forth this piece. And I would be doing it as much for myself as for her, for in her physical death was a symbolic one for me and for both of us the experience was a rebirth. For those who would see only grief and despair in this rendering of "The Final Battle," the piece is not meant. For those who see herein the glory of the struggle, unfaltering courage and faith in the ultimate good, may this sculpture ever be a reminder to them, as it is to me.